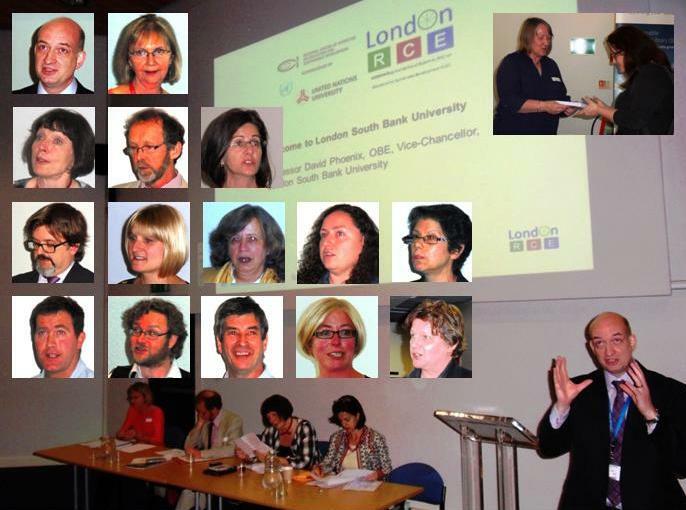 A Partners /Steering Group meeting of the London Regional Centre of Expertise (RCE) on Education for Sustainable Development (ESD) was held at London South Bank University (LSBU) on 27 June 2014. The next meeting will be held in September. ‘ESD London: Supporting employability, society and the environment: A curriculum for sustainability,’ the first annual conference of the London Regional Centre of Expertise (RCE) on Education for Sustainable Development (ESD), took place at London South Bank University (LSBU) on 10 June 2014. The event brought together educationalists, NGOs and employers with the aim of developing a London-wide community of practice in order to inspire and engage the participants in promoting a sustainable future for all. It comprised a keynote, speeches, panel Q&A, paper and poster presentations, workshops, networking opportunities and an awards presentation. The day began with a welcome to LSBU (the host institution of the London RCE) by Professor Phoenix Vice Chancellor. He said that sustainability is a core theme in higher education today and would remain so in the future. Emphasizing that universities should deliver back to society, he revealed that one of the key priorities of his own institution is civic engagement and, in this endeavour, sustainability would play a key role. Professor Ros Wade (Chair, London RCE), who led the team which achieved accreditation in 2009 from UN University for LSBU to develop the London RCE, presented an introduction to the day. In the past couple of years, London RCE has grown into a network of networks, comprising representatives from education, state, business and civil society from London and beyond. LSBU’s key strength that contributed to this achievement was its Education for Sustainability (EfS) Masters programme. Launched twenty years ago, soon after the 1992 Rio Earth Summit, this programme brought together academics and practitioners from Development Education and Environmental Education, with the involvement of Oxfam and WWF. Keynote address: Jane Davidson, former Minister for Environment and Sustainability and Minister for Education and Lifelong Learning in Wales, emphasized the need to ‘think global and act local’ in responding to sustainability challenges. Referring to the concept of the ecological footprint, she said that, in the economically developed world, we live as if we had a number of planets to support our lifestyles, but we have got only one. Turning to politics, she observed that elections lead to short term thinking and populism, adversely affecting the sustainability agenda. Moreover, voluntary action is sometimes not enough and an example is the necessity for plastic bag charge legislation. She also stressed that universities themselves need to think differently in the context of the challenge of sustainability. Learning to learn for sustainability in higher education: making a difference: Professor Stephen Sterling outlined some of the challenges that universities face with respect to the sustainability in their curricula and also pathways that have emerged. He observed that the concept of sustainability raises the question of the purpose of higher education. To contribute to sustainability positively, a holistic and transformative education is required. Although a whole institutional approach to change is difficult, it would be effective in the long term. He presented the 4C model, comprising three interlocking circles of Curriculum, Campus and Community, subsumed in a wider circle of Culture, stating that it could be adopted to bring about holistic change. He also reminded that ESD can colour all areas of curricula. Accelerating change for sustainability in higher education: A UNESCO DESD study: Professor Daniella Tilbury said that higher education has a critical role to play in developing a global vision and pathway for sustainable development. Presenting a summary of a global study carried out by the UNESCO, she revealed that, in the past decade, the progress achieved by universities worldwide in lowering carbon footprint of education is higher than that achieved in integrating sustainability into their core business, i.e. education. Moreover, she said that sustainability should form the core of what universities should be doing, not a side product. She noted that there has been much progress in networking and UN University’s global RCE network has helped universities to connect students’ learning to situated communities of practice. She also mentioned the University Educators for Sustainable Development (UE4SD) project, which brings together 55 partners (mainly universities) from 33 countries across Europe and beyond to rethink the higher education curriculum with regard to sustainable development. Over twenty papers with ESD-related themes were presented at two workshop sessions with parallel workshops in the morning and in the afternoon. (For a full list, please visit the links below under ‘More….’). Morning workshops were chaired by Dr Hugh Atkinson (LSBU), Margaret Burr (Humanities Education Centre HEC), Shaminder Takhar (LSBU) and Anna Portch (London Environmental Education Forum LEEF). Afternoon workshops were chaired by Dr Hugh Atkinson (LSBU), John Baines (LSBU) and Falko Schmidt. Jo Kemp said that students are saying sustainability is important. She revealed that the NUS is engaging students in sustainability in diverse ways, such as fun and collaboration (e.g. Students Switch Off, Students Eats), enabling action (e.g. Snap It Off) and working with and across institutions and communities (e.g. Students Green Fund, Green Impact). Aisling Tierney and Chris Willmore presented the Bristol University’s ESD model, which comprises four circles comprising formal, informal and subliminal curriculum (estates) and research, subsumed by a wider circle of community. They revealed that ESD at Bristol hasn’t got committees but only a network, enabling experimentation, quick action and bottom-up approach. Willmore said sustainability should be fun, about celebration and about giving ownership (Don’t tell students, etc, what to do; ask what their next step is). Esin Esat presented an overview on ESD in further education and said that the most important for the future of ESD in further education is student and staff engagement. Lynn Vickery (LSBU and Co-ordinator, London RCE) presented the awards for the best paper and poster submissions. The London RCE organised the conference in partnership with 4 All of Us and the event was supported by the EAUC, the London Universities Environmental Group (LUEG), NUS, Change Agents UK, Greenleaf Publishing, PRME, Brompton Dock and Open Air Laboratories (OPAL) network. The London RCE on ESD is part of the UN University’s global RCE network on ESD, comprising over 100 RCEs worldwide.